THREE-TIME COOKBOOK AUTHOR CHEF ERIKA STRESSES THE IMPORTANCE OF "KNOWING WHAT YOU ARE EATING - GO ORGANIC - FRESH - AS NATURE INTENDED." 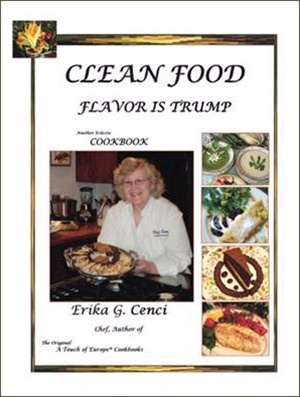 REWARD YOURSELF "Award winning European Chef Erika G. Cenci presents some of many proven sensational recipes, as always, using combinations of seasonally fresh 'clean food' that yield unimaginable flavor - consistently gourmet, and yet these recipes are surprisingly inexpensive, easy to do, and they are adapatable to every day meals. Cooking with "Clean Food" is naturally suitable for all lifestyles and occasions."